Patterns surround us, both casual and sublime: from the linear rhythms of fields and woodlands, to the intricate geometric designs found in cathedrals, palaces, and mosques. Natural or created, these patterns offer a sense of order, allowing the eyes and soul to relax and transcend. The geometric designs for this series were transcribed from Moorish tilework in the Alhambra and Alcazar Palaces in Spain. They were researched onsite with a BaderFund grant. 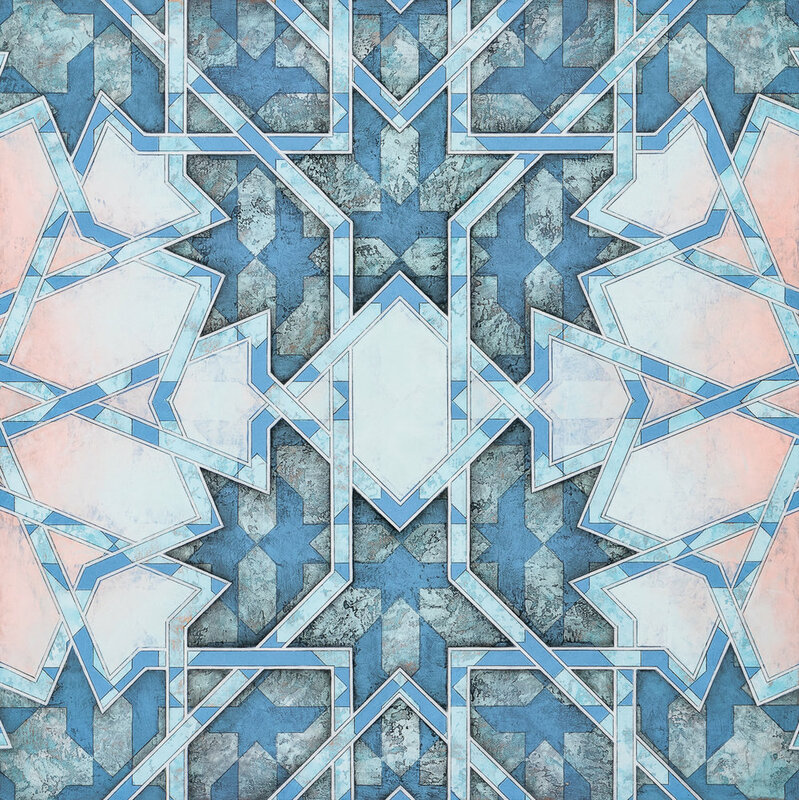 This work is part of a larger ongoing project, incorporating designs observed in Italy, Portugal, and Uzbekistan. Overlaying transcribed patterns, I look for linear interactions of various combinations. Painting begins with a richly applied foundation and a transfer of the first geometric arrangement. The surface is slowly built. Paint is applied and selectively removed by sanding, rubbing, and scrapping. Additional designs are layered to effectively weave the pictorial space, creating pathways and captured shapes that recede, float, or compress space. The resulting mandala-like images act as radiant structures. Some are still and contemplative. Others gain momentum and slowly pulsate with kaleidoscopic energy. All of the patterns explored are infinitely extendable - without beginnings or endings, and present a continuous rhythm to quiet the mind.